The long summer days were broken by exciting rides through the countryside. These stagecoach rides were probably the highlight of any visit to the White Mountains. They would leave the hotels in Bethlehem, drastically overcrowded by present standards, lead merry chases to the popular sights. Some of the popular local drives were the Cherry Valley Road and to Bethlehem Junction. “Around the heater,” a route formed in the shape of an old flat-iron, was also popular. 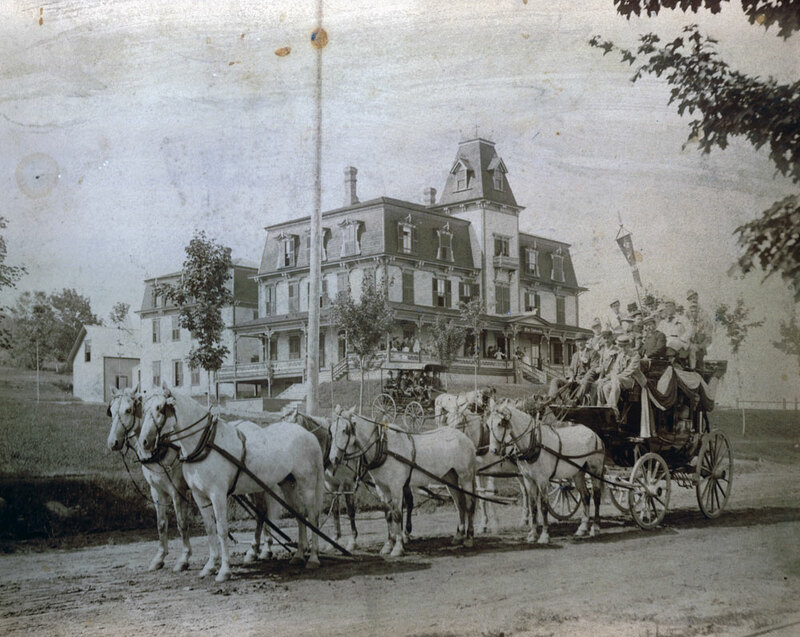 Beginning on Main Street at the Sinclair, the tally-ho coaches would drive westward and go left over Lewis Hill Road and back down again to Main Street via Agassiz Hill Road. Originally Agassiz Street was known as Railroad Street, even before Bethlehem had a railroad. Legend has it that a very early resident, who was unpopular, was run out of town over the hill to Franconia. The event must have made an impression for the road was known as Railroad Street for years. In 1886 Isaac Cruft, proprietor of the Maplewood, constructed a road around the Gale River following Swazey Lane and curving around Mt. Cleveland, eventually coming out on the present Route 142. Picnics and clam bakes were held near the river and present day snowmobilers still roar over portions of the original trail, which is now mostly grown over. Another popular trail was developed on Round Mountain in 1879. Round Mountain changed its name to Cleveland in the spring of 1893, to honor the newly elected president. A bridle path to the summit was completed by Sam Varney,the mountain’s owner. A few years later,in 1886, a wider road was built and an observatory was erected on the summit. Varney also built a foot path which branched off the Mt.Agassiz Road about one mile from Main Street. Ted Gardner recalls that one of the best views in Bethlehem, if not the entire north country, can be seen from the top of Mt. Cleveland. It surpasses the views from Mt. Agassiz because it is higher and in front of Agassiz and thus has a view of the Gale River Valley in addition to the sweeping mountain ranges. Currently owned by Nick Howe the moun- tain has a unique distinction which will be found by reading the chapter, The Upper­most House. Some of the “veteran whips” or drivers of the Bethlehem coaches were Will Noyes, Ed Cox, Sime Connery, Curtis Clark, Jerry Johnson, Sam Allard and W.E.Sanborn. In spite of the heavy loads and daredevil antics, it is amazing how few accidents occurred in those days. Only two accidents seemed to have been passed down to us. The first occurred on the back side of Lewis Hill Road where it intersects with the road to Franconia. Two coaches were on the run from Crawford to Plymouth, the first with a heavy load of young people. A young lady who saw the gaiety of the crowd in the first coach changed to that coach, which proceeded over Lewis Hill Road, then down the steep incline leading to the Franconia Road. The pole strap broke, forcing the heavy coach upon the pole horses which were unable to hold the load back and thus they began to run. The experienced “Whip,” Jerry Johnson, was unable to operate the foot brake and when he came to the sharp turn at the foot of the hill the coach overturned. The passengers were thrown to the ground and the young lady mentioned above received fatal injuries.The second coach which she changed from rolled into Plymouth unharmed. Another accident occurred in 1896 in Bethleheml Junction when a tally-ho coach, carrying 16 guests from the Howard House and driven by Mr. Dean, overturned after they came through the covered bridge over the Ammonoosuc. The passengers, however, landed in soft sand and none was seriously injured. The noise and gaiety of the summer tourists no doubt concerned the more sober selectmen of Bethlehem as witnessed by another news story July 31, 1889: “The blowing of horns at the Bethlehem station on the departure of guests has been prohibited. It has been the custom for a dozen or more lusty-lunged visitors, armed wth jumbo tin horns, to accompany the outward bound tourists to the station and see them off amid a valley of agonizing toots.” While the selectmen may have disapproved of the gaiety of blowing horns at departing coaches and trains, they, like all the residents and visitors of Bethlehem, enthusiastically approved of the annual coaching parade. At the second coaching parade, in 1888, U.S. Supreme Court Lamar was the judge of the parade. J.E. Smith was the first chief marshal with W.H. Webster as his assistant. General G. T. Cruft was chairman of the event for many years. About 1911 decorated automobiles began to make entries, and in 1914 a Phaeton was drawn by Mike and Dennis, horses from the Sinclair House that had participated in all of the parades since 1887.